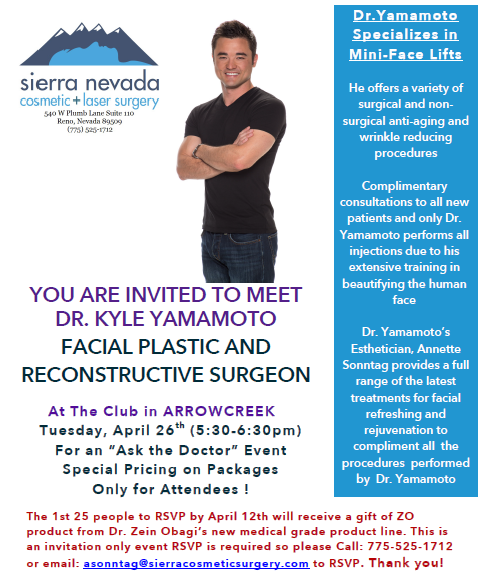 You are invited to attend Dr. Kyle Yamamoto‘s “Ask the Doctor” Session at The Club at ArrowCreek on Tuesday, April 26, 2016 from 5:30 to 6:30 pm. The first 25 people to RSVP by April 12th will receive a gift of ZO product from Dr. Zein Obagi‘s Medical line. This is an invitation only event! RSVP is required! To RSVP, call 775-525-1712 or email asonntag@sierracosmeticsurgery.com. Dr. Kyle Yamamoto’s profile tells his story. Dr. Yamamoto is a Reno native. After extensive training, Dr. Yamamoto has devoted his career to plastic surgery specific to the face. His extensive training has led him to become the first full-time, fellowship trained, Facial Plastic and Reconstructive Surgeon in Northern Nevada. He is an expert in the complex and intricate structures of the face, and offers a wide range of both surgical and non-surgical skills to rejuvenate, reshape, and repair. He is innovative in his approach to patient care and uses the latest technology to procure the best results. To print the invitation, click Here. Dr. Yamamoto’s office is located at 540 W. Plumb Lane, Suite 110, in Reno. This entry was posted in ArrowCreek 411, ArrowCreek411, Reno, Reno Cosmetic Surgery and tagged ArrowCreek 411, ArrowCreek411, Dr. Kyle Yamamoto, Esthetician, Facial Plastic Surgeon, Reconstructive Surgeon, Sierra Nevada Cosmetic Laser Surgery, ZO Medical Line. Bookmark the permalink.